In this digital era, there is no business that can run without a strong technological base. Be it a task as small as regulating the prices or as tedious as maintaining bills and payrolls, an ideal POS software can help do it all! A good POS software is known to be a perfect substitute for human capital. This software is not only cost and time efficient but also helps to reduce the stress of daily activities like calculation of taxes and inventory management. Working for years in the field of IT infrastructure and other billing and retail software’s, PAIT BIZ has established a brand name among all the retail POS in Pune. 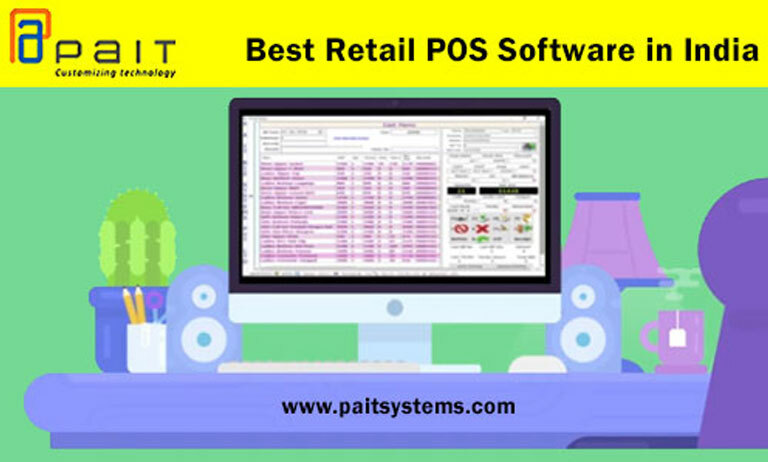 Among the variety of retail software’s available in Pune, PAIT systems are known to provide the best services to its customers when it comes to customizing the POS software according to the client requirements. Among all the competitors in this field, what separates us from others is our customer support service to our clients. The fact that our team of professionals can manage to work with minimal infrastructure requirements and just a few devices proves the skills and expertise of the technicians involved in the development of all the retail software at PAIT BIZ. A user-friendly interface is something that adds to the deal! With software’s available for different sectors, we have tried to cover each and every prospective business area which could have been simplified through this POS software in Pune. Here’s a list of all of them to provide you a deeper insight into our services in Retail software in Pune. For businesses ranging from small and medium to large, the basic retail POS has been upgraded to the next level. Be it the speed or the flexibility, this POS software astounds all the clients in the best possible way. The best feature of this retail POS is its portability and the fact that it has a centralized control which makes it stand out among all other POS software. Who could have thought that the rapidly growing technology could be inculcated in the food industry as well! These smart restro software easily help the restaurants to manage table bookings, bills, and even the menu cards. This technology up gradation has made the lives of all food chains much convenient. One of the most renowned IT infrastructure company in Pune, PAIT BIZ provides it all to its clients. These services introduced by PAIT BIZ, aim to introduce the level of expertise of their team to the clients by providing them with computer repair services at very minimal rates. This not only solves your one-time problem but also helps to give a deeper insight into how our team works when it comes to our clients. To experience all these services at the most affordable rates and yet no compromise in the quality standards contact PAIT BIZ now and just sit back and relax!